As a whole, the drivetrain continues unchanged from the previous iterations of the Sonata Hybrid, offering the same front-wheel drivetrain powered by a 2.0-liter gasoline 4 cylinder in combination with an electric motor sandwiched between the engine and six-speed automatic gearbox. The electric motor fills in for the naturally aspirated motor’s lack of torque and allows the automatic transmission to shift smoothly without any major drop in power. While not the most potent in performance compared to rival hybrids, it offers ample overtaking and pull-away performance. Of course the biggest upside to the hybrid drivetrain is the economy, which sees the Sonata Hybrid score a combined figure of 42 MPG which is lower than some rivals from Honda and Toyota. The Sonata Hybrid offers a comfort bias, but retuned steering and suspension for 2018 have ensure it rides, handles, and steers better than ever before. The Hyundai Sonata Hybrid pairs a 2.0-liter, 4-cylinder Nu engine developing 154 horsepower and 140 lb-ft of torque with a 51hp/151 lb-ft electric motor sandwiched between the engine and the 6-speed automatic gearbox. Total system outputs of 193hp are sent to the front wheels only, with the electric motor’s energy supplied by a 1.76kWh lithium polymer battery located in the trunk of the Sonata Hybrid. The battery is recharged via brake energy regeneration. Power is lower than that of rivals such as the Camry Hybrid and Honda Accord Hybrid with 202hp and 212hp respectively, but the Sonata Hybrid still manages to accelerate from 0-60mph in the mid-8 second range with strong performance courtesy of the torque fill from the electric motor. That electric fill also greatly benefits overtaking performance with power when you need it, though higher up in the power delivery range the Sonata Hybrid feels a little asthmatic. The EPA rates the base Hyundai Sonata SE Hybrid with economy figures of 40/46/42 mpg for city/highway/combined, while the higher-equipped Limited model is rated at 39/44/41 mpg. Both models feature a 15.85 gallon fuel tank. 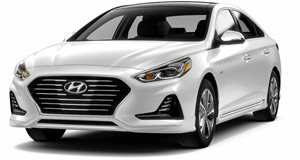 In the mid-size hybrid sedan segment, the Hyundai Sonata Hybrid offers consumption on par with the Ford Fusion Hybrid, but it is thirstier than the Camry Hybrid’s 52 mpg and the Accord Hybrid’s 48 mpg figures. For reference as to how much of an improvement the Sonata Hybrid’s consumption is over a regular model, a non-hybrid Sonata offers a combined consumption figure of 29 mpg in base trim.